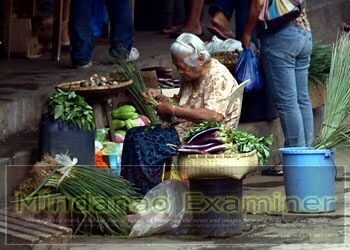 KIDAPAWAN CITY, Philippines (Mindanao Examiner / March 10, 2011) - An elderly Filipino woman sells vegetable at a market in the southern Philippine city of Kidapawan to help her family earn a living. The unrests in the Arab world have affected the prices of crude oil. Bloomberg reported on March 9, 2011 that oil traded below $105 a barrel in New York after stockpiles rose to the highest level since 2004 at Cushing, Oklahoma, the delivery point for West Texas Intermediate, the U.S. benchmark grade. It said futures fell 0.6 percent yesterday after the Energy Information Administration said Cushing supplies increased by 1.69 million barrels to 40.3 million last week, the highest since it began gathering data at the hub. U.S. crude inventories climbed more than forecast by analysts in a Bloomberg News survey. Unrest in Libya has also inflated the cost of refined oil products. Gasoline for April delivery advanced 8.05 cents, or 2.7 percent, to $3.0272 a gallon. The violence in Africa’s third-largest crude producer after Nigeria and Angola has cut output by as much as 1 million barrels a day, according to the International Energy Agency. The North African country pumped 1.39 million barrels a day in February, down from 1.59 million the previous month, according to Bloomberg News estimates. Saudi Arabia is capable of providing additional oil output if needed to counter supply disruptions caused by the unrest in the region, James Smith, U.S. ambassador to the kingdom, said in an interview on InBusiness with Margaret Brennan.